Terms can be highlighted in any of the 24 colors in the palette provided, making it easy to pick our your terms highlighted within each document. 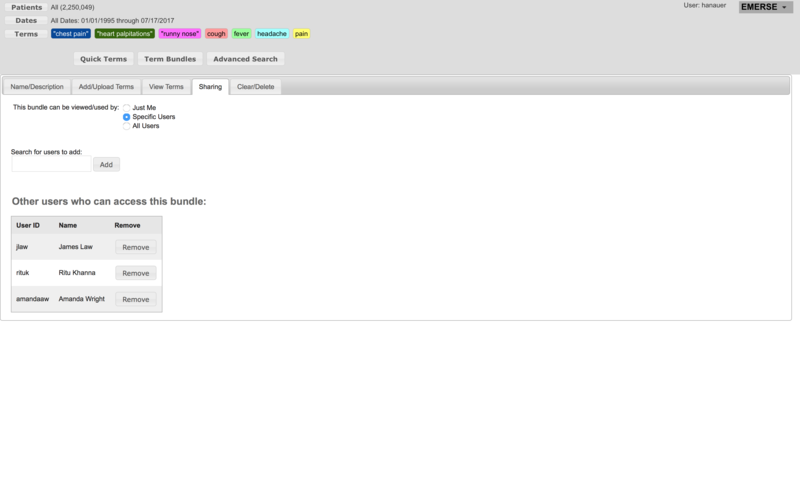 When using a Bundle, you even have control over the specific colors, so you can group concepts by color. With the Bundles feature, users can create groups of search terms that can be saved and share with their colleagues. 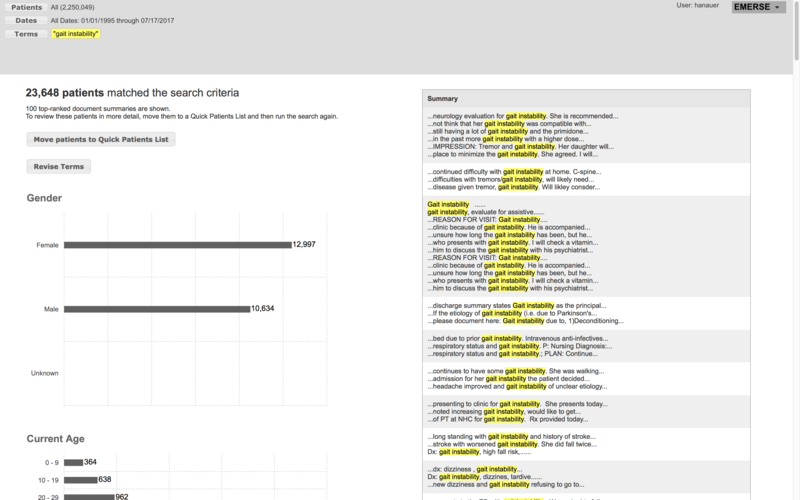 This provides a convenient way to standardize searches and ensure that everyone is using the same set of terms. Some research teams have even published their Bundles to promote reproducablity. 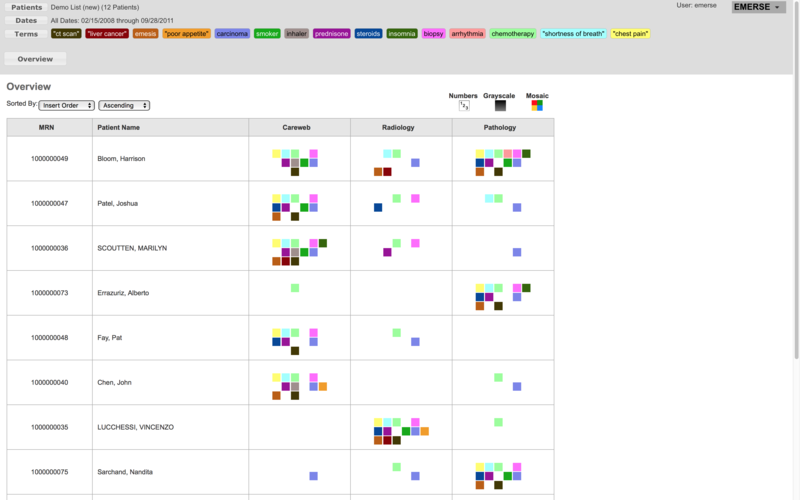 Our novel Mosaic view can provide you with a high level overview of what terms were found for each patient based on document source (radiology, pathology, etc). This view takes advantage of the color-coding of terms, described above. 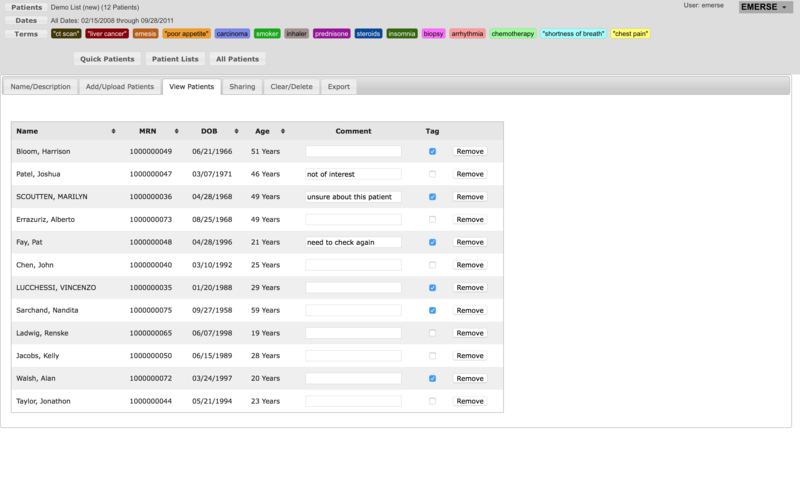 This allows for rapid scanning of search results to identify areas of highest interest. Expand your searches with a broad range of 'synonyms', which include variations in phrasing, generic and trade names for drugs, acronyms, abbreviation, technical and consumer-friendly terms, and thousands of common spelling errors that often appear in the clinical notes. The Synonyms collection contains over 600,000 unique entries! Save a list of patients for future use. Each list can contain up to 100,000 patients, and there is no limit to how many lists you can have. Lists can easily be changed by deleting patients or adding new ones. 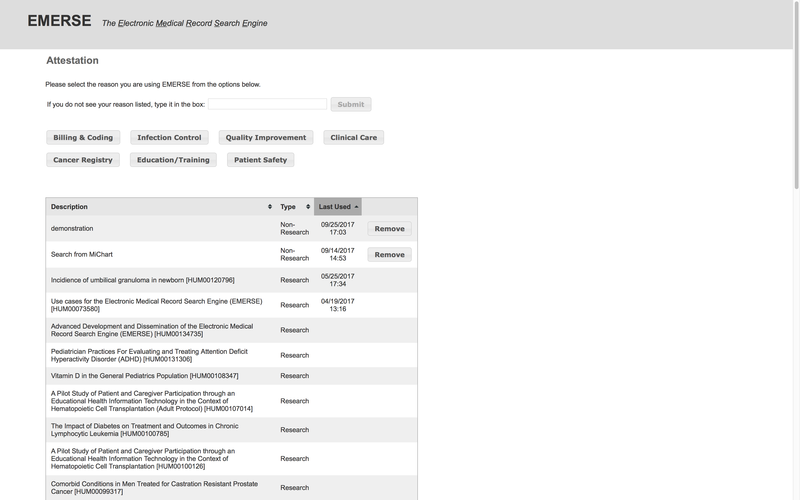 You can share the list with your study team, and even annotate the patients in a list as you are reviewing their records, by both tagging them and adding comments. These tags and comments can be exported, along with the patient lists, to a password-protected Excel file. Quick Patient lists allow for the creation of temporary lists of patients, perfect for reviews preparatory to research where patient information is not meant to be saved. 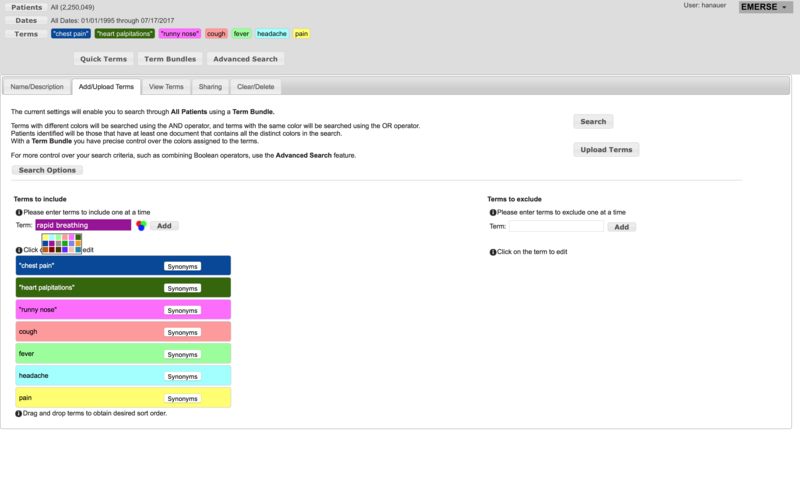 Search across all patients to identify a cohort, based on your custom search terms. Once a cohort is identified, it can be moved into a Quick Patients list, and then saved as a permanent Patient List if needed. 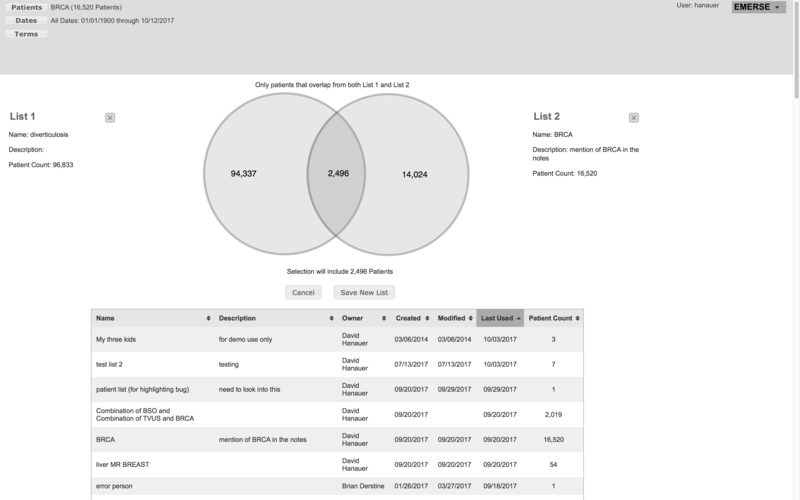 With the Merge List feature you can compare two Patient Lists and overlap them in a Venn diagram. , You can select the parts of the diagram you want, such as the complete set, or only the parts that overlap. Then you can then save a new list with just the subset you're interested in keeping. 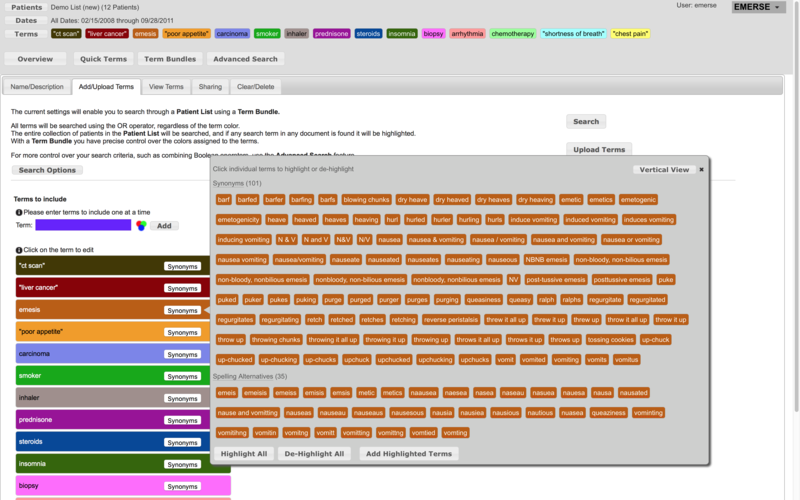 Built on top of the powerful and fast Lucene search engine, EMERSE provides advanced search capabilities including Booleans, regular expressions, wildcards, as well as fuzzy and proximity searches. Example: identify 'CT' and 'mass' within 5 words of each other. For teams with the right technical skills, EMERSE also provides Application Programming Interface (API) access to the underlying data so that queries can be executed through code as part of a data processing pipeline. This is a great solution for natural language processing (NLP) pipeilnes. 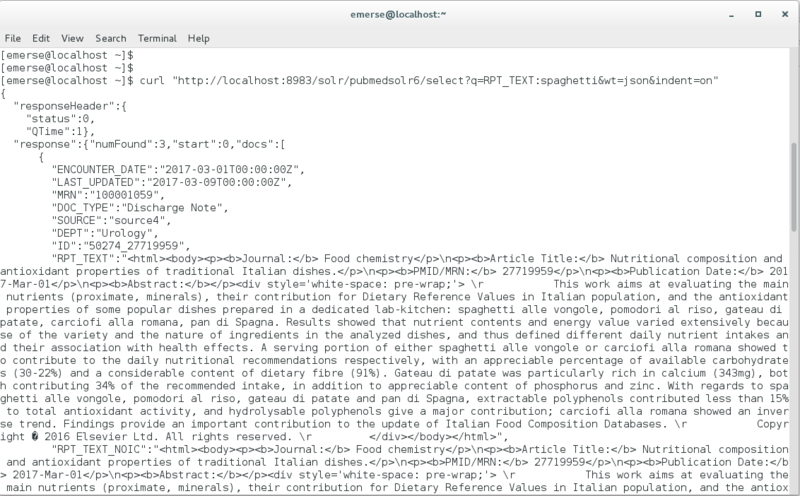 JSON output using curl on the command line. 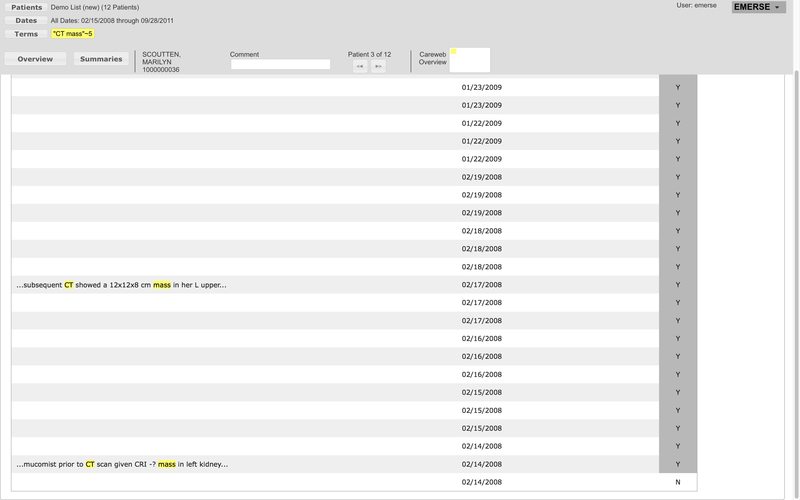 System administrators will be happy to know that EMERSE captures details audit trails of use, including a record of the reason for use at the time of each login. Further, EMERSE provides for the capacity to create numerous roles with the ability to turn on/off various capabilities within the system. Attestation page that users must complete when logging in.